SAN ANTONIO, Texas. – February 7, 2011 – Pizza Patrón, the nation’s #1 Latino pizza brand, celebrated theopening of its seventh store in San Antonio on Monday. 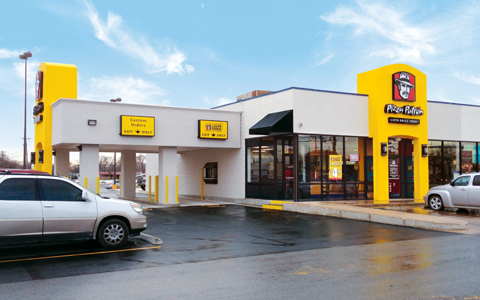 The store, located at 6700 S. Flores St., is the company’s newly developed ‘double drive-thru’ model, the first of its kind in the chain. CUSTOM ORDERS are completed in less than 5 minutes. LISTA ORDERS are ready as soon as the customer drives up, no waiting. Items offered on the LISTA menu are: large pepperoni pizza for $4.99, QuesoStix, wings (buffalo, lime-n-pepper and garlic-con-queso), churros and dips (ranch and spicy ranch). The concept, which comes on the heels of the development of two freestanding Pizza Patrón QSP™ (Quick Service Pizza) units in San Antonio, was also designed to improve the flow of traffic during peak lunch and dinner periods. Since 1986, Pizza Patrón has been committed to making its promise of “Más Pizza. Menos Dinero.®” a reality for every customer. From the beginning, the brand has been recognized for its ‘fresh-dough’ pizza, its low prices and its trademark “friendly, bicultural service.” In 2007, the company drew international media attention when it decided to accept Mexican Pesos at all of its restaurants, gaining over 500 million media impressions in the U.S. alone. Today, Pizza Patrón is the nation’s premier Latino pizza brand and remains dedicated to bringing its unique experience to life with every pizza made, and in every community it serves.